Envelope addressed to Harry Black (d. 1911), although the letter was likely for his son, Pilgrim Black (1905-2002), as Harry had passed away years before 1932. Original envelope from Roswell Motor Company to Harry Black: Private Collection of Patricia Ann Black. Digital reproduction of original envelope from Roswell Motor Company to Harry Black. Originally created by Roswell Motor Company and owned by Pilgrim Black. Roswell Motor Company. 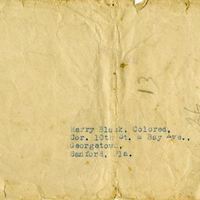 “Envelope Addressed to Harry Black.” RICHES of Central Florida accessed April 20, 2019, https://richesmi.cah.ucf.edu/omeka/items/show/2661.